Spondylolisthesis is a back injury involving a forward slipping of one vertebra over another and is most commonly seen in children between the ages of 9 and 14. Spondylolisthesis symptoms can be categorized into grade 1 to 4 depending on the level of severity. With grade 1 Spondylolisthesis there may be no symptoms at all and patients may be totally unaware they have a defect in the spine. 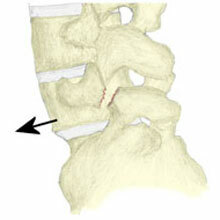 Grade 2 Spondylolisthesis symptoms may include lower back pain which may or may not radiate into the legs. The pain is made worse by activities which involve backwards bending of the spine. It may be possible to feel a dip in the spine at the point where the vertebrae slips forwards. An X-ray in a position that triggers the pain can confirm the diagnosis. Spondylolisthesis is a back injury involving a forward slipping of one vertebra over another and is most commonly seen in children between the ages of 9 and 14. It is also more common in sports that have a lot of strain on the back, for example, throwing events, wrestling, weight lifting, and gymnastics. The risk of forward slipping in people over the age of twenty-five is very small. It is usually the fifth or bottom lumbar vertebrae that is involved by slipping forward over the S1 (top bone of the sacrum). It is often seen in conjunction with a stress fracture of defect of the pars interarticularis (spondylolysis). Most cases of pars interarticularis defects that are associated with spondylolysis are those where there is a family history of the defect. Stress fractures of the pars interarticularis through overuse are thought to rarely to be the cause of spondylolisthesis. Grade 2 – greater than 25% forward movement. Grade 3 – greater than 50% forward movement. Grade 4 – greater than 75% forward movement. Rest from activities which cause or make the pain worse. The athlete may be able to continue training but avoid exercises that stress the back. Stretch the hamstring muscles as tight hamstring muscles may rotate the pelvis backwards in relation to the forward slipping vertebra. Do abdominal and core strengthening exercises. Wear a back brace or back support to prevent the lower spine bending forward too much (anti-lordotic). Gently mobilize stiff joints in the spine around the forward slipping joint (but manipulation should not be done at the joint itself). Operate if another treatment is not successful. Grade 1 and 2 patients can return as soon as they are pain-free and have good core strength. Grade 3 and 4 patients should avoid contact sports or sports involving high speed and changes of direction. Spondylolisthesis does not usually get worse, but if the amount of slipping increases then a surgeon may operate to fuse the bones together preventing further forward slipping.